Every effort has been made to accurately represent the product(s) and service(s) shared with you through this website, and or the FREE & PAID Website / Ad Submitter© eBook. Any claims made or examples given are for examples purposes only. Testimonials and examples given do not apply to the average purchaser, and are not intended to represent or guarantee that anyone will achieve the same or similar results. Each individual's success depends on his or her own background, dedication, desire, motivation and works, as well as other factors not always known and sometimes beyond control. You recognize most if not all business endeavors have inherent risk for loss of capital. The results featured on this website and within the FREE & PAID Website / Ad Submitter© eBook itself are not the norm, and are results from hard work, commitment and dedication by following the instruction given within the report. If you believe loading up on product information and joining program after program will grant you great riches, this is not for you. Your RESULTS will be based upon your ACTIONS. The products, services and information offered within the FREE & PAID Website / Ad Submitter© eBook are intended to help you with sharing your message about it with the world, while growing your business at the same time. We Guarantee you WILL make money with the FREE & PAID Website / Ad Submitter© eBook IF you follow the instructions. You will need to apply the training for it to work. Do as instructed and you will make money. Keep doing it and you will continue to make money pro-actively and passively. It's all about "Learn and Apply!" 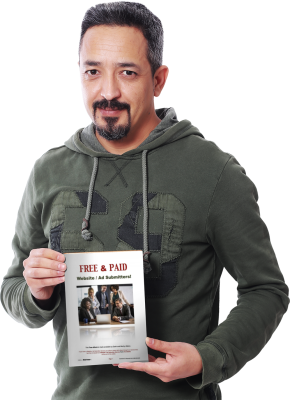 * There are No Refunds because there is NO COST for this FREE eBook. Should you have any questions about these Terms of Service, feel free to call Admin at: (408) 659-6486… MST USA, or submit them in the Question / Order Form at the bottom of the website.